In her run for district attorney, Queens Borough President Melinda Katz has vowed to hold developers and construction firms accountable for safety issues. But that hasn’t stopped real estate developers from donating to her campaign. More than $250,000 of the roughly $1 million Katz collected through Jan. 11 came from developers and other industry players, The City reported. That makes her the race’s top recipient so far of real estate-related donations. Her donors include David Walentas of Two Trees Management, Winston Fisher of Fisher Brothers and John Catsimatidis of the Red Apple Group. And some of the supporters have backed her for years, including her two runs for Queens borough president. Prior this seat, which she’s held since 2014, Katz was a Council member from 2002 to 2009 and served as chair of the City Council’s Land Use Committee. 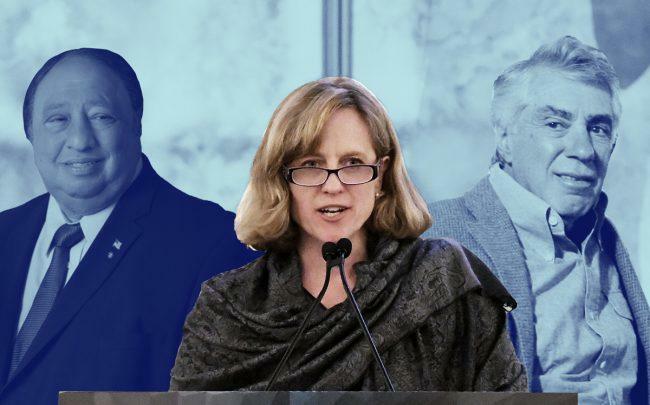 In between those two roles, she worked as a lobbyist with the law firm Greenberg Traurig, where a company associated with Forest Hills-based Muss Development was among their clients. Principal Joshua Muss and an associated firm have donated $5,400 to Katz’s campaign funds since 2018. Katz’s DA platform has included a promise to assign an investigator to every workplace accident that results in serious injury. “Developers and construction companies will be held accountable if they fail to follow the law and keep their workers safe,” her platform says.